This week started very slow, and on bank holiday Monday we found ourselves still pitched up on Riddings Campsite, which had been heaving over the weekend, but was experiencing a mass exodus that morning - I think everyone was trying to pack away while still dry and before the promised rain came!. And for us, we did very little - we just lazed about in the T4rdis, either watching the ‘decamping’ (which can be quite funny at times), watching the final of the snooker or reading, and as the weather was intermittently rainy, it was no hardship to stay indoors. Tuesday was passed with an outing for a haircut for me (which was way overdue), and then I accompanied my daughter Sarah for a minor hospital appointment, followed by a short shopping expedition in Derby - so really it was another day where there was little to write home about! However, Wednesday was a little more special. First, we did the boring job of restocking our cupboards, and then it was off out on a lunch date with my very dear friend Sandra. John dropped me off at her house in Allestree, and then we pottered down to the Markeaton Hotel where we shared a very pleasant lunch and lots of gossip. It was really lovely to spend time comparing notes about how our families are doing, as well as reminiscing about times gone by when we used to work together. Our time absolutely flew by and all too soon we were hugging and saying goodbye until next time, but even after that my day continued to bring smiles. John and I nipped to Sarah’s house where we were cajoled into making mud pies with our Grandson’s Jack and Thomas. On Thursday we left Riddings Campsite and headed off for a 'little holiday' - but Paul, please don't worry - we did vote before we left town! 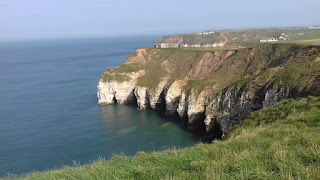 We went to Bempton near Bridlington to do a bit of coastal path walking and also to see the huge metropolis of sea birds that nest on the cliffs there every year, but specifically, we wanted to see the puffins. We'd booked in at the Wolds Campsite, and by about 2pm the T4rdis had materialised in their 'Puffin Meadow', and although we couldn't see puffins from our window we had lovely views over fields of bouncing lambs, and more distantly, out towards Flamborough Head Lighthouse. 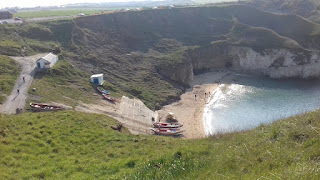 It didn't take us long from landing before we found ourselves meandering down the footpath that leads directly from the campsite onto the craggy cliff tops, and from there we had a choice, we could either turn left and head towards the RSPB site at Bempton, or we could turn right and head for the North Landings. We chose the later because we wanted to save the former for a full day out on Friday, but we were rewarded with some magnificent views of the cliffs, and we were even lucky enough to spot a couple of puffins leaving their hidden nest. However, when we reached our destination there were no refreshments available - both cafe and pub were closed, therefore we had to content ourselves with returning to the T4rdis and partaking of a little drop of very refreshing cider while we sat outside in the breezy sunshine. On Friday we packed our usual picnic and set of to see 'The Birds', but alas, we ended up in a similar situation to last year - we were to early to see any chicks, but nest building or perch claiming was in full swing. Many thousands of kittiwakes, razorbills, guillemots, gannets and shags had claimed their pitch, and were noisily informing others not to trespass. However, the puffins seemed to be absent, and despite very careful observation we only saw a very occasional one in flight - but the reasons why became clear when we read the information below. So here are two challenges for our little grandson's (or anybody else daft enough to try) :- can you make like a puffin and flap your arms 400 times a minuet, or maybe get 83 fish in your mouth? If so beware - your Mum and Dad might chuck you out in the middle of the night!! Despite the lack of puffins, we had a lovely walk, mostly in warm sunshine, along the spectacular cliffs, where many of the birds romantically sat in pairs - possibly waiting for the storks to arrive! And at least these days the birds are protected and wont be robbed of their eggs as they were in days gone by. Apparently climbers used to go over the cliff edge with just the aid of a rope while they stole the eggs from the nests. Once their bags were full they would jerk the rope and a mate would haul them back up, and this activity became so popular that tourists would flock to the area, either to have a go themselves, or just to watch! On Saturday morning we left our lovely Puffin Meadow which overnight had become enshrouded in a dense sea fog, (the bloody fog horn had hooted all night), and headed off to Hawes in the Yorkshire Dales, and happily, we found another lovely site that is surrounded by rolling fields full of frolicking lambs. In the afternoon (after an exploding egg saga - I tried to poach them in the microwave so it's all your fault Sarah), we went to explore the village and ate locally made ice-cream. Later, John sat scheming about how we're going to pass our time for the next 3 days - he seems to be planning a little ride up over Butter-tubs Pass! It rises to a height of about 550 metres, has sections that are 1 in 6, and is described as 'difficult' or 'get off and push' in most of the info available! Therefore, if no further instalments of this blog appear within the next week you'll have to assume the worst has happened to me!